Place a strainer open side down. Now put the hat onto the strainer as if it was wearing it. 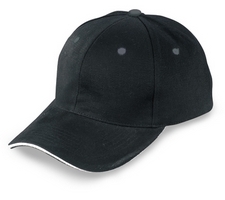 If the hat is very dirty spray with pre-treatment or stain removing spray. Place the second strainer on top of the hat, so the hat is sandwiched between the strainers. Fasten the strainers together with string, I recommend plastic string or cable ties as these wont run during washing. Place in washing machine and wash on warm setting using laundry detergent. Once washed and clean remove top strainer. Leave to air with strainer inside to keep the hats shape. Once completely dried place on top of head.